This title was first published in 2003. The Baltic Sea region offers exceptionally rich material for the discussion of civil society. This is because it has witnessed the erosion of communist regimes, the crisis of the welfare state, the increasing importance of new social movements and the shift from a centralist paradigm to one oriented towards networks. This engaging book focuses on the phenomena and prospects for civil society in north-eastern Europe which have had a major impact on political and scholarly debates since 1989. Nineteen experts from the region provide a comprehensive and comparative account of the history, the present state and the perspectives of civil society in the Baltic Sea area. The reader will learn that civil society should not only be seen in opposition to the state and that it has a major impact on current developments of European integration. 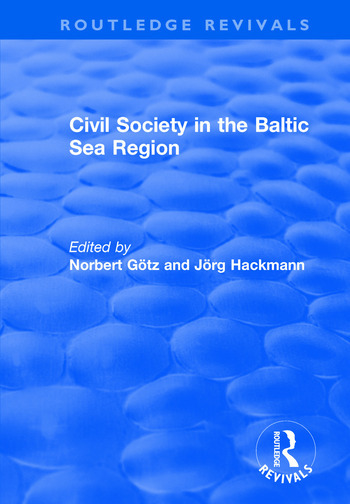 Contents: Part I: The Concept of Civil Society: Civil society in the Baltic Sea region: towards a hybrid theory, Norbert GÃ¶tz and JÃ¶rg Hackman; State, citizenship and civil society, Henrik Stenius; Is civil society possible without bourgeois society?, Dariusz Gawin. Part II: Historical Perspectives: Century of corporatism or century of civil society? The Northern European experience, Norbert GÃ¶tz; Civil society against the state? Historical experiences of Eastern Europe, JÃ¶rg Hackmann; 'Obshchestvennost': Russia's lost concept of civil society, Vadim Volkov. Part III: Preconditions in the Baltic Sea Region: Some theoretical remarks on civil religion and civil society, Walter Rothholz; The economic foundations of civil society: empirical evidence from new democracies in the Baltic Sea region, Claudia-Yvette Matthes; Civil codes for a civil society: aspects of private law reform in the three Baltic countries, Helmut Heiss. Part IV: Limits of Civil Society: Voluntary organizations and the Norwegian welfare state: from mutual trust to contracting?, Magne EikÃ¥s and Per Selle; Private and public welfare: Sweden's child day-care in comparative perspective, Ann-Katrin Hatje; Ethnic limits of civil society: the case of Latvia, Artis Pabriks; Ethnic limits of civil society: the case of Estonia, Aleksei Semjonov; The Russian mafia and civil society, Petra Stykow. Part V: Trans-National Cooperation: University exchange and post-modern transfer of civicness, Kazimierz Musial; Local and regional cooperation: the institutionalization of twinning, Carl-Einar StÃ¥lvant; The Saami people and Nordic civil societies, Reetta Toivanen; Networking civil society in the Baltic Sea region, Carsten Schymik; Talking 'Civil': learning from region-building, Pertti Joenniemi; Bibliography; Index. Dr Norbert GÃ¶tz, Assistant Professor of Nordic History, and Dr JÃ¶rg Hackmann, Assistant Professor of East European History, both work in the Department of History at the University of Greifswald, Germany.